I had my life organized so my insomnia was under control. I’d accepted—not very gracefully—the fact that I was going to have to get vigorous exercise not just 3 or 4 days a week but EVERY SINGLE DAY. This was part of the dues I personally was going to have to pay to be a member of the Recovering Insomniacs Club. The exercise routine I came up with wasn’t bad. But then calamity struck. The exercise routine I came up with wasn’t bad. Every day I forced myself to drop whatever I was doing at 5 p.m. to take a bike ride or head down to the basement for a session on the elliptical trainer. Sleep was more dependable as a result. I even started looking forward to the workouts. Sometimes it took effort to warm up. But the surge of energy that usually came after 5 or 10 minutes, when my muscles were limbered up and working in sync, felt great. Not to mention the blissed-out feeling I had when I stopped. The extra slice out of my day wasn’t really such a big price to pay for holding insomnia at bay. Then I started having pain in my left knee. All weight-bearing activities that involved bending at the knee should be avoided for a few months, the orthopedist said. “Not until your knee gets better,” he said (a touch too cheerfully, I thought). “No jogging either, but the elliptical trainer might be OK.” Swimming was really the way to go, the doctor added–especially strokes with a flutter kick. Swimming? Flutter kick? My heart sank. An hour-long schlep there and back to the pool in rush hour traffic? Changing into and out of a bathing suit every day? Showering and then washing and drying my hair in a locker room? The added expense? Why this, in God’s name, and why now?! The grinding of my knee as I galloped along on the elliptical trainer made it clear that my Old Faithful was no longer an option. The facts were plain to see: I was going to have to become the fish I used to be in childhood. Otherwise my sleep was down the tubes. I fumed over this turn of events for about a week. Then grudgingly I packed up my suit and towel, launched myself into rush hour traffic (listening to NPR to keep the road rage in check), and started swimming laps. Swimming was OK. The water was cold at first but exhilarating by the end of the first lap. After 3 months, when I realized my knee problem was probably permanent, I started swimming at a wellness center newly opened up near my house. Call it denial or a kind of middle-ager’s Stockholm Syndrome, but now I’ve decided I actually like swimming laps and look forward to it (if not to the 12-minute drive). 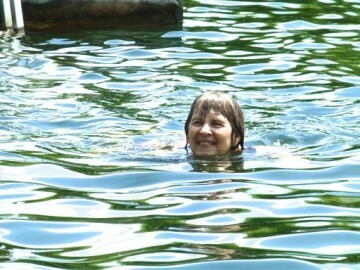 Swimming in the lake outside my husband’s family cottage is even better. This photo was taken over Memorial Day, when the water was bracing. My sleep continues to be pretty good. Swimming isn’t my first choice of exercise (and I certainly never chose my insomnia). But Stephen Stills got one thing right: If you can’t be with the one you love, love the one you’re with. What sleep challenges have you experienced or did you experience in middle age?